HomeWorld Chess ChampionshipCarlsen vs Karjakin 2016World Chess Championship Countdown: Carlsen-Karjakin, Wijk aan Zee 2012. The week of the World Chess Championship 2016, has arrived. 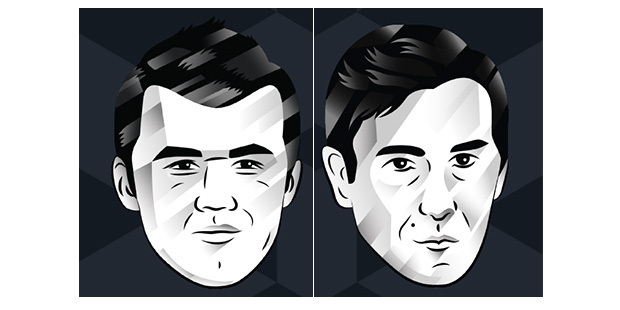 There are only a few days to wait before Magnus Carlsen begins the defence of his title against Sergey Karjakin. Carrying on the countdown to the event, we look at another of their decisive games. In the first, we saw Karjakin being punished for a couple of untimely quiet moves; in this example, we see him doing the punishing. The game took place at the Tata Steel Chess Tournament in Wijk aan Zee, Holland, in 2012. In the Accelerated Queen’s Indian, Carlsen, playing White, is the first to err, with his 18.Ne4(?). This allows his opponent to obtain a very advanced passed pawn. From here, the Russian plays extremely strongly, piling great pressure upon his Norwegian opponent. Carlsen does his best to defend, but the damage had already been done and in the end all resistance is hopeless.